Shuttlecock is going to help you fly your freak flag in style this week. We have a massively talented and eclectic lineup set for a Friday night show at The Snake Tank starring Oakland band Preening. Featuring members of Flesh World, Violence Creeps, and other Bay Area ensembles, Preening's off-kilter post-punk and no wave is just as dance-able as it is confounding. 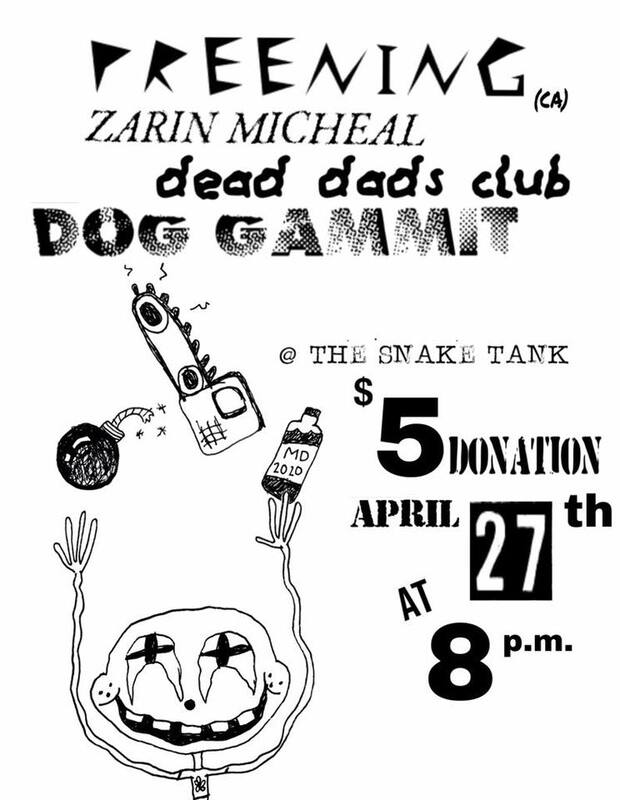 Joining our touring guests will be tough-as-nails Kansas City rapper Zarin Micheal, guitar pop purveyor Dead Dads Club, and newcomer punk band Dog Gamm!t. The show is taking place at The Snake Tank (DM @ShuttlecockMag on social media or email AaronRKC@gmail.com for the address) on Friday, April 27. It's an all ages show, doors open at 8pm, and there's a suggested donation of $5 (pay what you can, nobody turned away) for Preening.